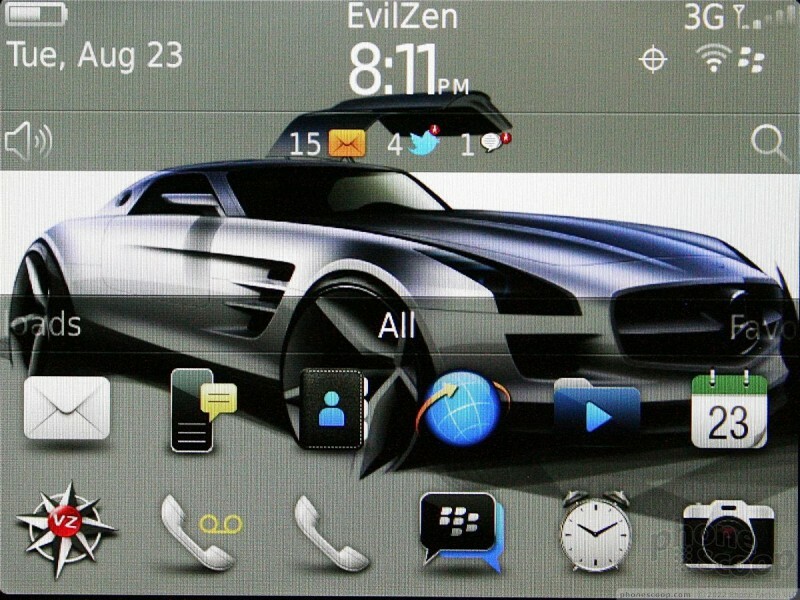 The Bold 9930 runs BlackBerry 7, which is a refreshed version of RIM's system software. 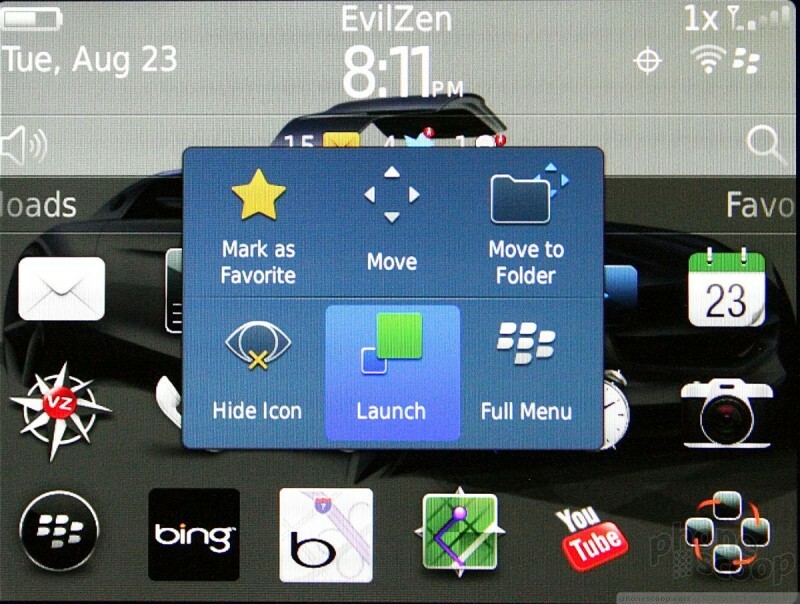 There are tweaks aplenty compared to what was available in BlackBerry 6, but they are barely noticeable. The home page has a number of different elements with which to interact. From top to bottom, the basic home screen has the status bar, the notification bar, main screen/wallpaper, and the app tray. The status bar — where the clock, signal indicator, battery meter, etc. are located — is the top-most element. Press the time at the topÂ from the home screen[g], and it opens up a tray of tools, such as network controls (WI-Fi, etc. ), the alarm clock, and other basic settings. This feature doesn't work from other screens, only on the home screen. The notification bar acts similarly to the drop-down notification shade in Android. 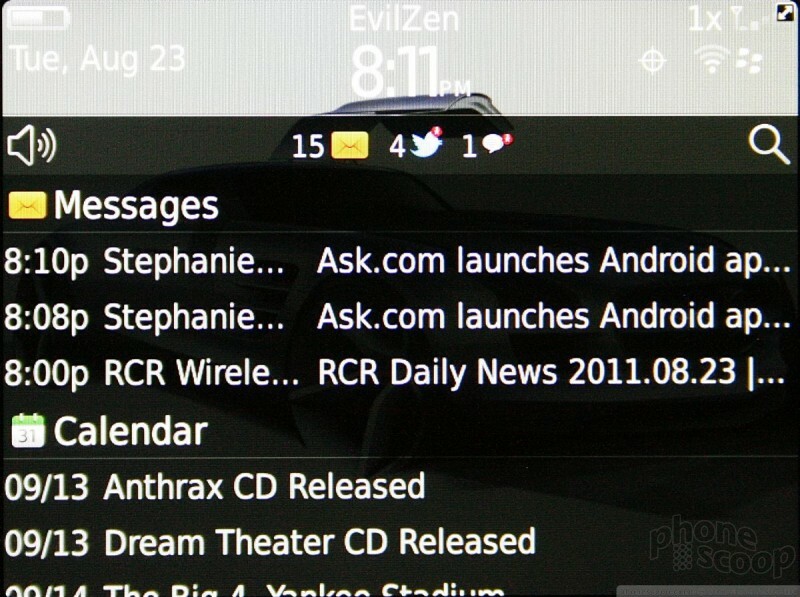 Tapping it lets users quickly get a look at all of the unread messages they may have received. This includes email, SMS, MMS, BBM, Twitter replies/DMs, and Facebook notifications. You can see the first handful of each message type, and view info such as the sender and subject. Want to hide all the notifications? Tap the bar again and it goes away. If you do want to read a message, select it and the notification app will open the message in whichever messaging service it belongs to. 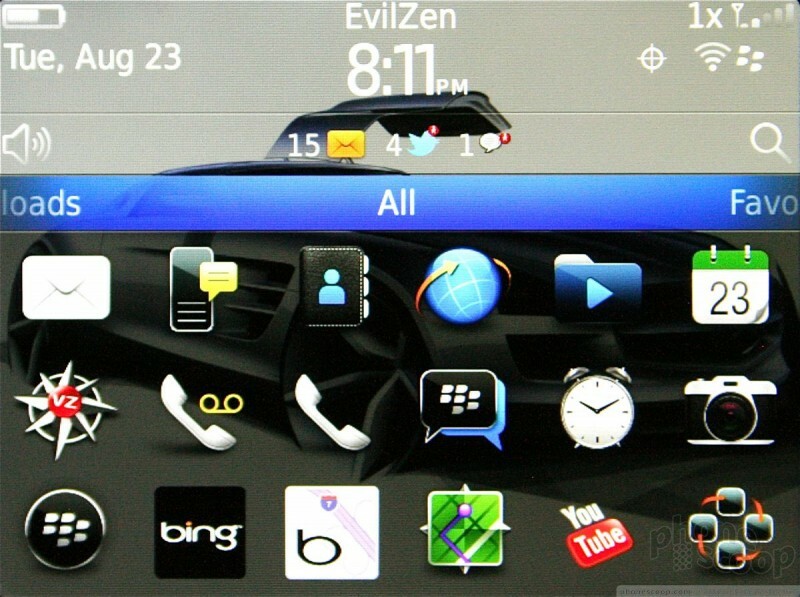 The app tray is where users will really be able to customize BlackBerry OS 7 handsets. The tray offers five different user-configurable home screens / menus. The first (and default) screen lists all the apps. The second lists those used most frequently. The third shows all downloads. The fourth is reserved for media. And the fifth is for user-chosen favorites. When the app tray is open users can swipe sideways between these five different home screens. The Universal Search tool has been updated, though it behaves mostly as it did in BlackBerry 6. For example, if I type "Phone Scoop" while on the home screen, the Universal Search pulls up all the relevant items on the 9930 and delivers them to the desktop. This includes contacts, web sites, and so on. Do the same thing for quick access to a contact, or song, or any other application that you don't want to peck through the menus to find. If what you're looking for isn't on the phone, it offers web-based tools (YouTube, Bing, BlackBerry Maps, etc.) to continue searching. Press-and-hold gestures can be used to open secondary menus in some applications. For example, in the contact application, the press-and-hold gesture conjures up the options menu, offering shortcuts to calling, texting, emailing, editing the contact and other actions. Use press-and-hold on the home screen, however, and the options will include moving, opening, deleting, or hiding the selected app, among other actions. The real improvement doesn't come so much from BlackBerry 7 but from the fact that the 9930 is a touch phone. Being able to reach up with your thumb and select menu items instead of using the trackpad saves gobs and gobs of time. Research In Motion today announced a new series of Bold handsets, the 9900 and 9930, which marry a traditional BlackBerry QWERTY keyboard with a touch screen. The new Bolds are the first BlackBerries to include near-field communications (NFC) for mobile payments. Wi-LAN has filed a lawsuit against Research In Motion alleging that the BlackBerry maker is infringing on a single patent related to Bluetooth technology. Wi-LAN says a number of RIM's smartphones, such as the Bold, Pearl, Storm, and Torch, infringe on the patent. Research In Motion was hit with a lawsuit by NXP, which alleges that RIM's BlackBerry Torch, Curve, and Bold smartphones infringe on six of its patents. NXP wants sales of the devices halted, and compensatory and triple damages. Verizon Wireless has made operating system updates available to both the Research In Motion BlackBerry 9930 Bold and 9850 Torch. Both are being updated to OS version 7.0.0.374 and include extensive change logs. Research In Motion today announced a forthcoming update to its BlackBerry 7 platform that will add an application called Tag. The application makes use of the near-field communications chip on recently released BlackBerry smartphones so users can share contact information, documents, URLs, photos, and other multimedia content by tapping their BlackBerry smartphones together.